HobbyTron - a general store of RC airplanes and other hobby products - By clicing at this banner you will find many helicopter and aircraft models, and also a lot of other hobby articles. Most of the models are electric driven. Please click here to see one of the models and browse for all of the others. Store with good offers on consumer electronics - and also many RC aircraft models - In addition to all kind of electronics you will also find a fine collection of hobby products you will find a lot of remote controle hobby aircraft models for an affordable prize. Most models are electric driven but there are also some nitro models. You will also find many other types of hobby items. This is one of "THE EASIEST TO FLY" and the "MOST DURABLE" RC Airplane that we carry. Super stable with a crash resistant fuselage make the WD3 the best value possible. Equipped with a powerful brushless motor and a high thrust triple bladed propeller for solid power needed for rc flying. Easy to take off or land from grass due to the large wheel set. Comes complete and ready to fly with all electronic components pre-installed from factory. Features a 2.4 GHZ radio system for a 4000 foot glitch free range. Includes 1000 Mah - NiHm battery and wall A/C charger..
Patrol the sky in style with mini fighter jet style RC drone! Ducted fan electric motors for rc airplanes. By clicking any link you can find motors with more measures than those exhibited. 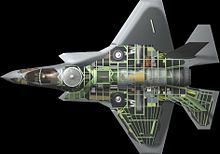 The F-35 has been under development since 2001 by Lookheed under a project originally named Joint Field Striker (JFS) headed by the American ministry of defence with some contribution from allies. It was intended to be fully developed by 2008, but the project is so far 7 years behind the schedule, and is not expected to be combat ready before 2015-2018. The project is working however under a philosophy of beginning the production and test of the planes before fully developed with new details installed on existing planes as they get ready. 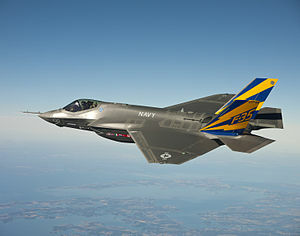 The plane is therefore by 2013 under test in several squdrons in USA and UK, and pilots are under training. The plane which is intended to replace most existing fighter planes now in use by USA and allies, is produced in three versions. The A-version (CTOVL-version) is the the simplest and cheapest on, but also the versjon ith highest capcities in the air, because it does not have to carry extra equipment for special take-odd and landing conditions. It is for use by land based forces. It takes off and land in ordinary mode from airports. The B-version (STOVL version) is for use by the US marines and similar corpses that operate from small aircraft carriers or combination vessels with a caertain carrier capacity.This can take off vertically by low load and after short run by heavy load, and it can land vertically. The short or vertical take off and landing is achieved mith a flexible nozzle at the back that can direct the jet stream downward and even somewhat foreward under the plane, and a fan just behind the cabin that blows air from the top out from the bottom. The fan is driven by the motor. The C-version (CATOBAR version) is for use on greater aircraft carriers. It can take off by the help of a catapult and stop after landing by help of a hook and wire. It also has hinged wings so it can be stored in a less place. Even though it si generally called a fighter plane, it is actually a mulitirole combat aircraft intended to be used as an air to air feighter, air to ground fighter and bomber, air to ship fighter and bomber, for communication jamming, for reconessance and for combat lead. It is not intended to be used as a long range bomber though. The plane has stealth capabilities, which means that it is little visble on radar and is thus supposed to be able to approch near to a goal without being detected. These properties are achieved with a coating that absorbs much of the radar waves, with a shape that reflects the remaining radar waves in other angles than stright back to the radar, with shielding of hot spots in the plane and by hiding weapons in intarnal bays. The plane also has cooling at hot spots avhieved by circulating fuel. But by full weapom load, much of the weapons must be mounted under the wings and then much of the stealth properties are lot. The plane has a top speed of around 1.6 mach fully loaded, which is below the top speed of many of the planes it shall replace. It is however capable of flying in a supercruice mode during a limited time, which is flying above the speed of sound without using the afterburner. It is capable of swing radiuses that excert a centripetal force of 4.5-6 G which is also below the capabilities of the planes it shall replace, and below the original requirements for the plane. It has a mission range of 1200 nml (2200 km) or combat radious of 584 nmi (1,080 km) on internal fuel, but that can be extended with outer tanks. The plane has also the ability to be refilled from an air-born tanker. The fairly low dynamic properties are a direct consequence of the construction properties needed to make a stealth plane. One does not yet know if the stealth properties are worth sacrifising top dynamic perfomance, and one will not know before the plane has been proven in real combat situations. The plane is powered by one single turbofan motor especially constructed by Pratt and Whitney for this plane. This motor is the most powerful in the world of its size, but yet this heavy plane is concidered somewhat underpowered and the motor is concidered somwhat ineconomical. A new motor is therefore under construction for future versions of F-35 and other planes, that wil exploit the fuel better, and therefore allow higher speed and longer range. Hydraulic actuators in the plane use fuel as driving fluid instead of oil from a separate oil tank in order to spare place and weight. This arrangement has been critizised because it can cause fuel leakage and greater risk for fire. The plane has only one single seat. The stearing functions of F-35 are easy to use and highly utomated, which allow the pilot to use more of his skill on strategy and use of weapons. The plane is also equipped with highly efficient and long reaching capabilities of keeping overview, detecting targets and threats and aiming at the targets. Also functions like aiming and fireing are easy to use and higly automated. he system can detect possible targets automatically, and hold aim at these until the pilot decides to fire. 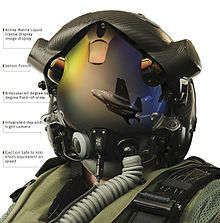 A key component of the pilot's equipment is a helmet with a vizire that gives him a 360 degree overview and which allows to aiming at a target by merely moving his head. These functions can also be controlled with voice. The plane is also equipped with advanced functions to take down information from satelites and sharing information with ground based command and other aircrafts in the air. The plane is constructed to be easy to maintain and key komponents can be replace within an hour. The estimated cost of each plane is $137 million which, is high and doubling since 2001. this is high, but the project claims that ease of pilot training and maintenance, and the fact that on single plane can perform several tasks, will spare overall money throughout the planes lifetime. the plane is esitnated to be in production to around 2035.